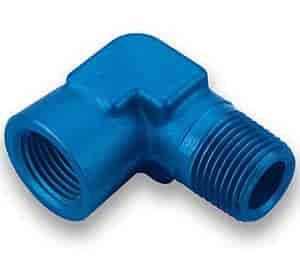 Earl's NPT to NPT Adapter Fittings are lightweight anodized blue aluminum (unless otherwise noted) in your choice of sizes and angles for custom plumbing applications. 991401 is rated 5.0 out of 5 by 1. Rated 5 out of 5 by 2zrVios from Perfect I bought this to use with my oil pressure gauge sender, because of tight clearances. It works great!